If you’ve ever had a churro from a local carnival, then you know they’re the perfect combination of crunchy, sweet, and delicious. Did you know that you can make your very own at home? It’s actually a pretty easy Mexican dessert, and you don’t need a deep fryer to do it. In fact, there’s a good chance you already have everything you need in your pantry right now. Start by combining the sugar and cinnamon, then set it aside. Put a small saucepan over medium heat on the stove and use a whisk to mix together the water, salt, 1.5 tablespoons of sugar, and two tablespoons of vegetable oil. Bring it to a boil before removing from heat and adding the cup of flour. Mix it all together carefully until it forms a ball of dough. Now, you’ll need to transfer the dough to a pastry bag with a large tip. Time to get the oil ready for frying your churros. Add the remainder of your vegetable oil to a large pot and heat until the oil temperature reaches 375 degrees F. Use a candy thermometer to ensure accuracy. Then, two or three at a time, pipe the churro dough into the oil, using scissors or a knife to cut the ends. When piping the dough into the hot oil, be careful not to splatter any of the oil onto yourself. Let the churro dough fry until the churros are golden brown; then, carefully use tongs or a spatula to remove each churro and set onto a plate lined with lots of paper towels; this will help to soak up the oil and keep your churros from getting greasy. Once the churros have cooled off for a few minutes but are still warm, roll them in the cinnamon sugar mixture. 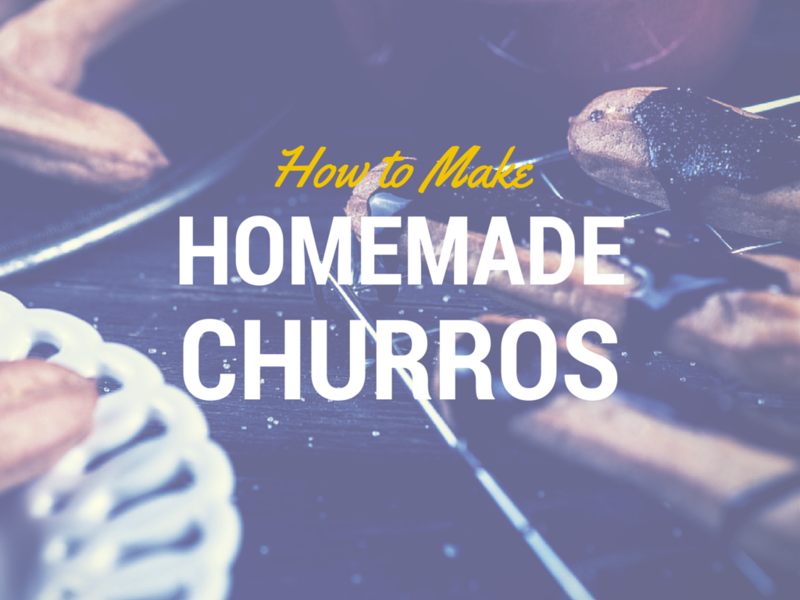 Repeat until your churros are all fried. To create a chocolate dipping sauce, place a small glass bowl over a small saucepan filled about 1/4 of the way with boiling water. Then, add small pieces of the dark chocolate to the bowl and whisk as it melts. Gradually whisk in the heavy cream until the entire mixture is well blended and you have a yummy, smooth chocolate sauce to serve up with your freshly made and golden brown churros! This is just one of many simple Mexican dessert recipes we share on the Macayo’s blog, alongside many other traditional Mexican recipes we love, such as the perfect chimichanga or a delicious Pico de Gallo.